It’s really a sad start for the 2008 year. 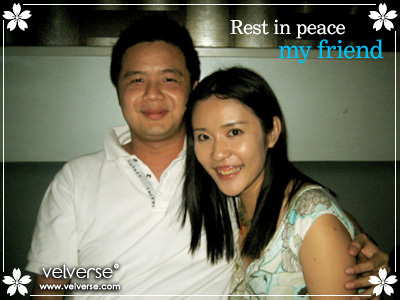 Last Wednesday… on the Thaipusam holiday, my boss.. Edwin Lee passed away :(. Sigh… it really is a great lost. He is more than a boss to me. My yum char kaki… a friend to joke around with… and I must say, I really miss those times when he kept telling us his diving experience over lunch. The office just isn’t the same without his funny and silly jokes… his laughter. Office felt just so different. Something seems missing from my MSN list. Seems like there won’t be any response even how I try to fight poke over facebook. I’ll really miss you Edwin. Rest in peace.